The first time I heard Bessie Smith was during a broadcast of American Roots Music on the radio. I heard her song I Need a Little Sugar in My Bowl. I was absolutely stunned, not just by the incredible voice, but by the brazen sexuality in the song. How else to interpret such lines as "I want a little sugar in my bowl, I want a hot dog between my rolls"? I literally blushed when I heard it. Now the Empress of the Blues gets the biopic treatment with Bessie. The film might have been better titled Impressions of Bessie, as we get a hodgepodge of Smith's life but not much about Smith herself. Bessie at times leaves one wondering what exactly happened, but while the somewhat jumbled nature of the film goes against it, the performances lift it up. 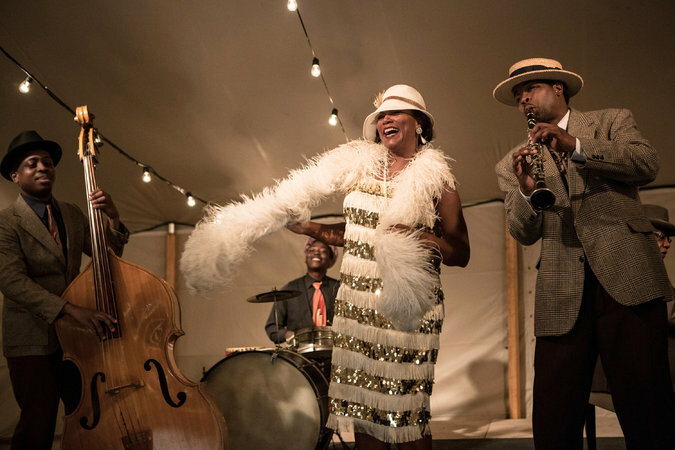 Bessie Smith (Queen Latifah) is an up-and-coming blues performer going with her brother Clarence (Tory Kittles) to various halls to try and move up. However, she keeps failing the 'paper bag test', where black performers have to match the color of a brown paper bag to be considered for larger spotlights. Frustrated, she hops onto the train of the reigning Queen of the Blues, Ma Rainey (Mo'Nique). Ma sees Bessie Smith, despite her country roots, has something special and makes Bessie her protégé, showing her the tricks of the trade and the business side of 'show business'. Smith soon starts getting notices thanks to Ma Rainey's mentorship, and inevitably upstages the diva (at one point, literally). Rainey doesn't cotton to such things, so they split with Smith (who now has her own strong following and reputation) striking out on her own. Ma Rainey and Bessie Smith have something else in common: both are passionate bisexuals who go through men and women with equal pleasure. Bessie's longtime girlfriend is Lucille (Tika Sumpter) who travels with her. Lucille, however, also knows that Bessie likes the boys, and into Smith's life come two men. The first is Jack Gee (Michael Kenneth Williams), who 'auditions' as Smith's bodyguard and who eventually becomes her husband. The other is bootlegger Richard (Mike Epps), who supplies her with more than bathtub gin. Smith has highs and lows in her life. There is the trauma of her childhood, which involves her wicked sister Viola (Khandi Alexander), who is still wildly disapproving of Bessie until they slowly start repairing the years of damage. There is her own scandalous life: one that involves getting stabbed after she tells off a man at a party who was harassing her crew and a vicious run-in with celebrated photographer and 'liberal' Carl Van Vechten (Oliver Platt) who thinks Smith is the perfect embodiment of what he calls "N****r Heaven". Smith soon achieves great success...but also great failures. She adopts a son and names him Jack Gee, Jr. (much to the displeasure of Gee, Sr.). Devolving into alcoholism, first Lucille, then Jack leave her (the latter taking Jr. with him). Changing tastes also affect Smith, as she finds that despite her success with major label Columbia her music isn't as popular in the Depression as it once was. Smith reconciles with Ma Rainey (who wryly comments she could write a book too about her experiences and call it Cracker Hell), and decides to make a full-scale comeback. She is approached by musicologist John Hammond (Bryan Greenberg) to be part of an anthology concert, but she leaves him hanging. At the end, Smith and Richard (with whom she finds a level of happiness), sit in the back of a truck, contemplating what the future holds. If one wants a straightforward biography of Smith, I think they'd be better served to read one than go to Bessie. The film goes through a lot of material in a jumbled manner where a lot of things are presented but not answered. For example, we get a lot of flashbacks to Smith as a girl (filmed quite poetically I might add) that suggest something happened to her mother. The voice-over of Viola telling Bessie that Bessie had caused her mother's death intrigues us, but exactly what happened to Mrs. Smith we never learn. We never learn what happened to Jack Gee or Jack Gee, Jr. At what appears to be a pivotal moment, a group of Klansmen come to try and storm their way into a tent concert during her comeback and Smith, ever bold, goes out and confronts them. The Klan ups and runs, and she goes back to the concert. Yet this seems to not strictly come out of nowhere but to be added for dramatic purposes. I cannot say whether or not something like this DID or DID NOT happen, merely that it seemed to be put in there. The same can be said after Smith is stabbed on the street (there's some alliteration for you). She appears to become delusional, insisting she has a show to do. Rising from the hospital bed, she goes out the hallway, through a door...and straight onto the stage, where she gives a song. Was she crazy? Was director/cowriter Dee Rees (who made the excellent Pariah) attempting to be rather artistic? It again wasn't so much confusing as it was cluttered, as if Rees was trying to put too much in and giving us more a 'greatest hits' rundown than a true exploration of Smith as an artist and as a woman. This of course is not to say Bessie does not have strong qualities. Chief among them is our beloved Dana Owens as Bessie Smith. It is fitting that the Queen play the Empress of the Blues. Latifah brings the arrogance and vulnerability to Smith. She makes Smith a fascinating woman: strong but sometimes insecure, hurt and hurtful, seeking pleasure and seeking peace in equal measure. 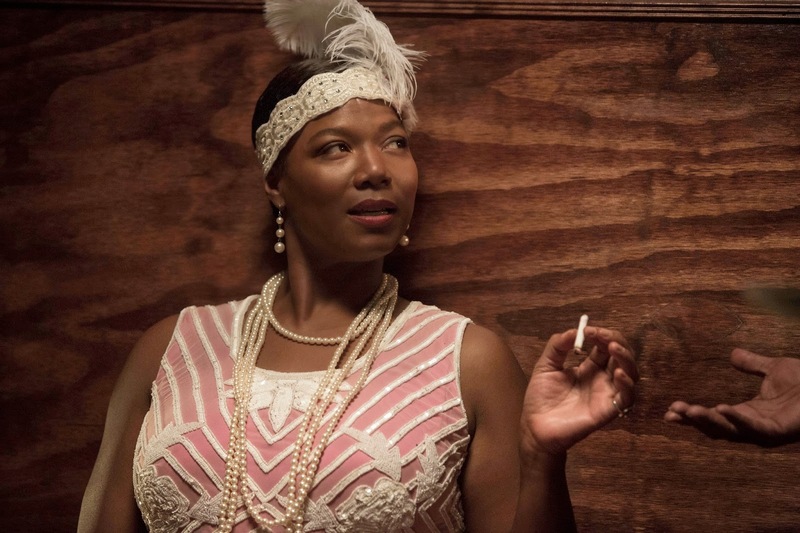 Latifah can sing and act, and Bessie is yet another strong showcase for her extraordinary talent. Equaling her is Mo'Nique as Ma Rainey. Though she had a smaller role Mo'Nique was equally fascinating as Smith's mentor, who showed her a much wilder world than even Smith could imagine. In one scene, a man approaches Smith for a tumble, but she declines. When one of Rainey's female stage performers comes up to Smith, Smith asks where Rainey is. To her surprise, she's told she was just talking to Rainey herself. Smith looks up to discover Rainey, in full drag, going up to the stage to perform a la Dietrich. Their scenes of combativeness and reconciliation were so wonderful to see: the anger Rainey had mixed with the concern for her former protégé at how far her life had fallen. Sumpter, in the smaller role of Smith's mistress, had less to do but she to her credit made Lucille (whom I understand was a composite character) into someone who loved Smith with all her flaws. Alexander was wicked as Viola (but in this case, a good thing...such an underused actress). Epps and especially Williams were also standouts as the men in Smith's life. I don't fault the acting (which was quite good from all parts). I fault the jumbled, rushed story and the bits and pieces that didn't seem to go together. Bessie is worth watching for the performances (particularly by the Emmy-nominated Latifah and Mo'Nique). I'd say Bessie is not up to the Empress' standards, but it is a good primer for a fascinating figure in musical history.